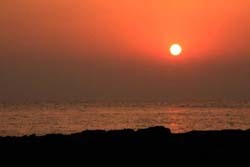 If you have or could make Pune or Mumbai as your base, a great weekend break awaits you in Konkan, Coastal Maharashtra. Sun kissed beaches, swaying palm trees and thatched roofs add up to make an awesome landscape. Dash of history and spicy seafood builds up the glory. Early Saturday morning I set on a 400 km. drive from Pune. The round trip took me through some awe inspiring journey via Mulshi, Tamhini Ghat (mountain road), Mangaon (on Mumbai Goa national highway), Harihareshwar, Sriwardhan, Dive Agar, Dighi and Murud Janjir. My halt for the night was at Harihareshwar. I reached Pune, well in time for dinner on Sunday evening. The road all along, I would say ranks from good to excellent save for a few bad patches which are worthy to be tolerated. 50 km. from Pune is Mulshi. Thanks to the Mulshi dam, the road along the massive backwaters is just fascinating. Not surprising that many have their weekend homes built along the lake as also on the mountain slopes. 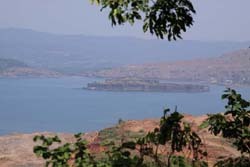 Mulshi is a popular day trip location from Pune. It has many restaurants and lodges for the overnighters. Some resorts are coming up too. After crossing Mulshi and a drive through picturesque mountains, dotted with lush green vegetation, I negotiated Tamhini Ghat. The mountain road and some 40 km. more, took me all the way to Mangaon to meet with national highway no 17. Folks coming from Mumbai would reach Mangaon in less than 3 hours. A left at Mangaon and a right turn few hundred feet away led me towards Harihareshwar - a sea side destination famous for its calm beach and the Harihareshwar Temple of Lord Shiva. The 60 km drive from Mangaon to Harihareshwar took around 2 hours. The 30 km. diversion from Mhasala to Harihareshwar was not up to the mark. Hopefully, by the time you plan a trip, the road would be better, cutting down the driving time dramatically. I reached Harihareshwar at around 11:30 AM and checked into Maharashtra Tourism Development Corporation's Resort. The property is situated right on the beach albeit the approach to the beach is not all that comfortable. Moreover, there are more rocks than sand near the property. MTDC offers cottages and deluxe tents. The rooms are basic and the air-conditioning makes it rather comfortable. It's advisable to book your stay in advance with MTDC either in Pune or Mumbai. Depending upon the season of your travel the rates per room would range from Rs 1600 to Rs 2400. The property is generally full during holidays and weekends. It has a restaurant on site which serves all three meals at stipulated times. Gazebos on the edge of the beach make for a good place to eat or unwind. Looks like home stays are quite popular in Hariharshwar as well as other coastal towns in the Konkan (one of the regions of the State of Maharashtra) belt. I am sure you will find a room even during peak times. Every other home had a sign that announced homely stay and home cooked food� which essentially would consist of 2 o 3 types of vegetables, fish (catch of the day), prawns and rice. After checking in, I headed to the Harihareshwar Temple about a km. away. It's an ancient temple also known as Dakshin Kashi (Varanasi of the South) dedicated to Lord Shiva. 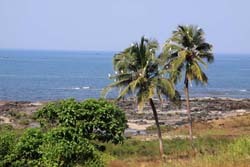 Right on the shores, over looking the Arabian Sea, the premises also has a temple dedicated to Lord Kalbhairav. It's customary to pay tribute first to Kalbhairav then to Lord Shiva and the again to Kalbhairav. Since the lines were short, I completed the ritual in about 30 minutes. On Mondays, public holidays and during the month of Shravan (monsoon) expect long queues. More about Lord Shiva, the Jyotirlingas in my travel notes from Bhimashankar and Ajanta & Ellora. Outside the temple premises, I had my lunch at one of the homely restaurants. I headed back to the hotel for a little siesta and to prepare myself for the evening walk on the beach to witness the setting sun. It was low tide. From the hotel I could walk on the rocks and reach further down giving me an undisturbed view. When the tide is high or if you are not staying at MTDC, the beach near the temple also offers some great sunset viewing. The sun was down at about 6:30. Sadly, it was a very clear day with no clouds. No photographer would like that. In the evening the 3 gazebos that the hotel had were full with guests. Dinner consisted of vegetable curries, prawns and Halwa - the catch of the day served with steamed rice and chapattis (Indian bread). The next morning, after breakfast I checked out. 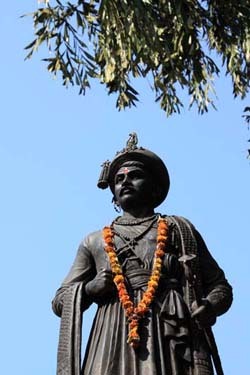 20 kms away was Srivardhan - another sea-side town and the birthplace of the first of Peshwas - Prime Ministers of the Maratha Empire (more about them on my notes on Pune). As I cut across Srivardhan town I was pleased to see typical Konkani homes and store fronts� kept the way it used to be in the good old days. At the other end of the town was a memorial built in the memory of Balajirao Peshwe. I was saddened at the state of affairs. A gate, a row of rooms and a statue was all that the memorial had. Not to forget the litter that was all around. There was neither a caretaker nor any information plaques. I lasted there for about 7 minutes. The sorrow was changed to amazement as soon as I reached the Srivardhan beach. Miles of clean white sands, silent waves, a few fishing boats offered a panoramic view. Despite the sun above, I spent an hour roaming about. If you ask me, I think Srivardhan beach is better than the beaches at Harihareshwar, unless I have really missed something. It would be safe to say that from Sriwardhan I set sail to Dive Agar. The next 20 kms. of my drive would rank amongst the best ones that I have had. The road runs parallel to the sea. At times the road would just touch the beach and at times it would lead you up the hill. To my right were lush green plantations and to my left was the blue sea. Not to forget the occasional fishing villages and the paddy fields. This little journey reminded me about my drive on The Great Ocean Road near Melbourne. Of course, that journey lasted for hours and hours. This was for just 45 minutes. My next stop was Dive Agar about 20 km. from Srivardhan. Another quaint little coastal town with fine beaches. 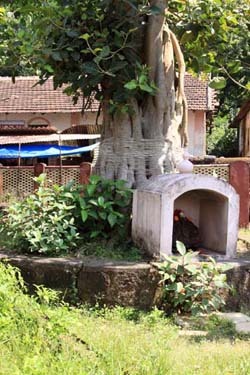 The town is also famous for the temple of Lord Ganesha (elephant headed God). Once I reached Dive Agar I headed straight to the Ganesh Temple. The temple has gained popularity because the deity of the Lord, made of solid gold, enclosed in a copper trunk, was found by a peasant while working on her farmland in 1997. She promptly handed over the find to the authorities who built the temple thereafter. With mentions in the media, the popularity of Dive Agar was built rapidly. From Dive Agar I headed towards Dighi, about 15 km. away. 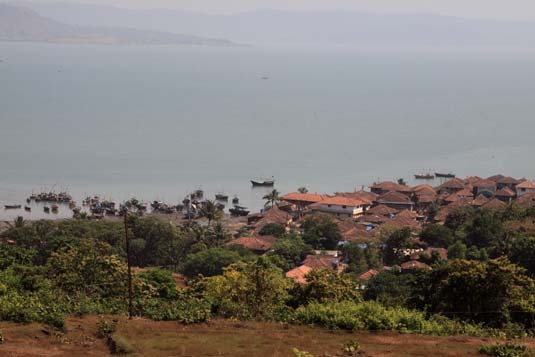 Dighi is popular for the access it offers to Murud Janjira - a sea fortress - in control of the Siddhis. As much as the Great Maratha Emperor, Shivaji, or the Portuguese or the British tried to conquer this fort no one ever succeeded in the fort's history of 350 years. This sea fortress is strategically located on the mouth giving the occupier an advantage. Launches run from Dighi to the Murud Janjira Fort & back. Unfortunately, when I reached the pier, the launch had just left. The capacity of the launch is 100 seats. And the owners would need at least 50 passengers to make the trip viable for them. Since more passengers were not around the next trip was at least a few hours away. The return trip costs just Rs 26 (at the time of writing 1US$ fetched about Rs 46). Passengers get about an hour to explore the Sea Fort. I am told the fort is majestic with the star attraction being fresh water well right in the middle of the sea. 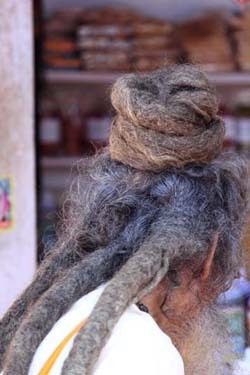 Well, sooner or later I will make it. However, to take a view of the fort, I drove up a nearby hill that gave me a good view of Murud Janjira Fort as well as another small sea fort Kaas - which was built by Shivaji to keep a close eye on the movement around. Being near Mumbai, Dighi is now poised to become a major port. The construction work is progressing rapidly. Time was to turn back and head to Pune. The loop was complete when I reached Mangaon. On my way back I was fortunate to interact with farmers who were busy harvesting paddy - the region's staple grain.